offer free WiFi Internet Access! All cottages are housekeeping units, two night minimum stay. With the exception of Cottage 3, each contains a fully equipped kitchen including cooking and eating utensils, electric coffee pots, and toasters. All linens are provided. 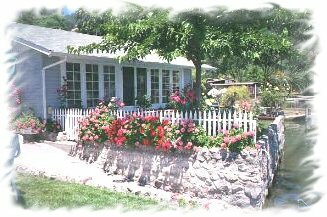 Cottages are tastefully decorated, impeccably clean, air conditioned and have cable televisions. For the comfort of our guests, cottages furnished with queen size sleeper sofas contain Simmons innerspring mattresses. For the enjoyment of registered overnight guests only, we offer a lakeview meeting/social room with a comfortable relaxed atmosphere, wicker furniture, games, puzzles and a library. A lighted pier, boat slips/mooring, launching ramp, private beach, picnic tables, lawn furniture, individual Weber barbecues, complimentary morning coffee, tea and hot cocoa and ice are available to our guests. A microwave oven is also available and charcoal briquettes can be purchased for a nominal charge.